We just released RBTools 0.5.6, which fixes several bugs with Perforce. A couple of the new commands, such as rbt status, would crash when used with Perforce repositories. These have been fixed, and you should now be able to use rbt status, rbt diff, and others without any problems. We also fixed a long-standing bug with matching Perforce repositories. In previous releases, if $P4PORT was pointing to a server where you had an active client, RBTools could end up matching that client's repository instead of the one in the current directory. For example, if running inside a Bazaar repository, or (in some releases) in a Git repository. That should no longer happen in this release. There's also a fix restoring Python 2.4 compatibility in rbt setup-repo. While the 0.5.x releases support Python 2.4, 0.6.x will not. If you are running Python 2.4, we recommend upgrading. See the release notes for the complete list of changes. Last week, we announced the release of the Review Board Power Pack, an add-on product for Review Board that provides PDF document review, GitHub Enterprise integration, and scalability improvements. Starting today, we've made it easy to try it out. Simply fill out the form and a 30 day trial license will be sent to your e-mail address. You can then follow the instructions for installing Power Pack. We'd love to hear your feedback. We're working on some exciting new features for Power Pack that we know our users will love. We'll talk about those more in the coming months. This week has been full of great releases, but we're not done yet. Today, we're excited to announce Review Board 2.0 beta 2! New look-and-feel for review requests, review UIs, and the login/registration pages. Ability to review any text files, just like diffs, complete with syntax highlighting and multi-line commenting. Bulk closing for review requests on the dashboard. Rewrote search support, making it very easy to install. No more PyLucene! Security checklist to help catch some common security vulnerabilities. A new rb-site management command for compressing your database up to 50%. Whole lot of new extension features and API additions. That's just the summary. The release notes cover all the exciting changes in this release. We think you're going to like it. We have one very important note for upgrading. We always say this, but back up your database! This release uses a whole new mechanism for automated database migrations, and it's possible there are still bugs to work out. If you do have a problem, please contact us and let us know. We're pleased to announce general availability of the Review Board Power Pack. The Review Board Power Pack is a set of advanced features to help you get even more out of your peer review system. Source code is only one part of the software development process. PRDs, design proposals, end-user technical documentation, and patent disclosures are just a few of the numerous documents that get written, discussed, and edited along the way. The document review extension brings the same powerful, lightweight review process to PDF files that developers have enjoyed for their source code. 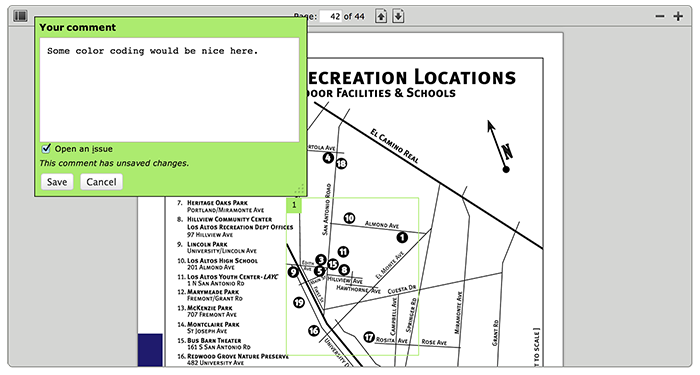 Documents are displayed right in the browser without a need for any plug-ins or extra software to be installed. For companies that use GitHub Enterprise to manage their source code behind the firewall, the Review Board Power Pack adds support for these repositories. Configuration is simple: just tell Review Board the URL of your GitHub Enterprise server, and then link an account with a username and password. Most Review Board installations work fine running on a single server, but some very large installations with many thousands of users may require additional hardware for speed or fault tolerance. The Review Board Power Pack includes facilities for storing auxiliary data like SSH keys in the database rather than on the front-end server's filesystem, which allows you to add capacity by spinning up additional servers as needed. The Review Board Power Pack is licensed under a subscription model. The price per user is $8.33/month. If you'd like to arrange a trial of the Review Board Power Pack, or if you have any questions, get in touch at support@beanbaginc.com. Review Board 1.7.21 is out, with support for GitLab and Unfuddle, optimizations to diff generation, and several bug fixes. GitLab is a self-hosted, open source alternative to GitHub that has grown popular recently. It had previously been difficult for people to get GitLab working with Review Board, but now it should be as easy as any other service. Unfuddle is a Git and Subversion hosting service with an emphasis on project management and task tracking. Review Board now supports adding repositories on Unfuddle for either Git or Subversion. Diff render time for large diffs should be a lot faster. Really large diffs that could take up to a minute to render now only take seconds. This is due to an optimization made to our diff algorithm. If you see any breakages as a result of this change, please let us know. We also have additional API support for filtering lists of repositories, bug fixes for Beanstalk integration, and many other improvements. See the release notes for the rest of the changes. Update January 14, 2014 at 7:40PM PST We put out a 0.5.5 release. We were missing a change for the Subversion repository name fixes in 0.5.4, and had a minor option we decided to backport to post-review. This came out very shortly after 0.5.4 was released. RBTools 0.5.4 is out, with a handful of fixes for rbt patch, Subversion, and more. rbt patch, one of our new tools introduced in 0.5.3, has had several bug fixes for Unicode commit messages and for applying commits under Git. There's also a compatibility fix that will be required for the upcoming Review Board 2.0 beta 2 release (stay tuned!). We fixed an issue with looking up repositories using Subversion. When setting REPOSITORY = to a name instead of a URL in .reviewboardrc), rbt post would fail. rbt post would unintentionally pass this name to the svn commands, assuming it was a URL. This should no longer happen. Those of you using rbt post with Git may have noticed that --revision-range no longer accepted arguments in the form of revision1:revision2 on RBTools 0.5.3. We're working on some major improvements for specifying revisions for the 0.6 release, and unfortunately some of this work prematurely landed. We've restored compatibility. See the release notes for the full list of changes. Happy New Year, everyone! We have a great RBTools release for you, with some new features and a whole lot of bug fixes. rbt post has a new -u option that attempts to update an existing review request, instead of posting a new one. Previously, unless using Perforce, you would have to pass -r with a review request ID in order to update an existing review request. Now, when using -u, RBTools will look up possible matches and present them, confirming the update. We think this will be a major time-saver. A new rbt setup-repo command makes setting up your repository much easier. Instead of writing a new .reviewboardrc file by hand, just run rbt setup-repo. It will prompt for the Review Board server, then attempt to automatically match up repository name, and then write the configuration file for you. rbt patch has a new --print option for printing the patch instead of applying it, and --commit to apply and commit with the author's name and review request's description. --commit currently only works on Git. rbt diff doesn't crash anymore! Huzzah! Along with this, we have fixes and improvements for using third-party commands, Git, Bazaar, Mercurial, and Subversion.